Because no catalog of the cut-glass items that were produced by John S. O’Connor’s factories has come to light, it is difficult to assemble a list of pattern-names, and even more difficult to illustrate them. Nevertheless, this file is a start in this direction. This invoice is especially valuable because of its list of “Special Designs”. Note especially the Tuxedo pattern. This is the first mention we have of the factory’s name for the patented pattern that was known as “Rattan” for more than half a century. Currently no information has been found for the Gem and La Reine patterns. 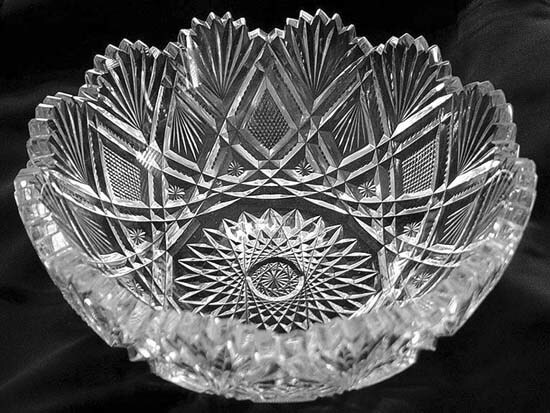 The Princeton pattern was cut at least as early as Aug 1894 when it appeared on a punch bowl that served as first prize at a local regatta (The Jewelers’ Circular, 6 Feb 1895, pp. 59-60); it could have been cut a year or two earlier. The Crescent pattern (unnamed) appears in a 20 Mar 1895 ad that was placed by Geo. Borgfeldt & Company in The Jewelers’ Circular. It is identified in O’Connor’s own ad that appeared in the 19 May 1897 issue of the same trade paper (p.32). 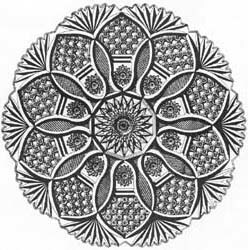 In light of the fact that the pattern is derived from Hawkes’s Chrysanthemum, it was probably first cut soon after 1890. Few companies seem to have paid attention to Chrysanthemum’s 14-year patent. Congress appears in a newspaper excerpt that is reprinted, undated and without a reference, in Barbe and Reed (2003, p. 190). (It is accompanied by three additional O’Connor patterns: Senate, Prince of Wales, and Lace Diamond.) The 400 pattern refers to that privileged segment of ‘Nineties society, while Blooming Grove is a settlement about a dozen miles from Hawley. (Coincidentally, there is also a Blooming Grove, NY, which is a similar distance from Goshen.) No illustrations of these last two patterns, together with the Gem and La Reine patterns, have yet been found. 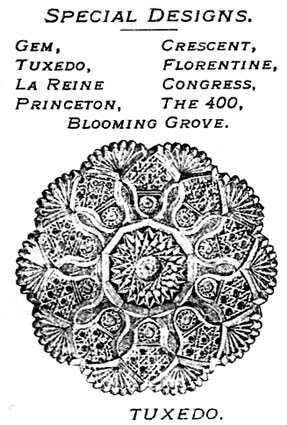 Blooming Grove is the latest pattern listed, having been “prepared for the coming season” according to the 13 Jan 1897 issue of Jeweler’s Circular. It is likely, therefore, that the invoice was printed in late 1896 or very early 1897. It is worth noting that Astoria, a high grade pattern introduced in 1898, is not on the invoice’s list. Contrary to what Feller has written (1988, p. 27), O’Connor retained his rights to the Florentine pattern when he patented it in 1888; he did not assign the patent to C. Dorflinger & Sons, even though he was employed by the company at this time. But he did permit Dorflinger to cut the pattern. When O’Connor patented his Tuxedo pattern in 1892, he was no longer formally employed by Dorflinger. But, as with the Florentine pattern, he allowed his former employer to cut it. These two examples indicate the cordial relationship that existed between Christian Dorflinger and his long-time employee. “Rattan” was the name Dorothy Daniel assigned to the Tuxedo pattern in 1950, because at that time its official name was unknown. Given this date, it is not surprising that Feller had the following experience in 1988: “There are no references to “Rattan” in any Dorflinger company records and for this reason it has been excluded from my exhaustive list of patterns in chapter 9″ (Feller 1988, p. 38). Feller’s list (pp. 114-7) actually does include the “Rattan” pattern — but it is listed as Tuxedo (p. 27)! This “Rattan”/Tuxedo confusion also appears in Letitia Cusick Connelly’s biographical sketch of her grandfather. Connelly failed to notice that the two patterns are identical. She therefore lists “Rattan” and Tuxedo as if they are two different patterns. In view of the prominence of the Tuxedo pattern on the aforementioned invoice, O’Connor must have thought highly of it. It is, therefore, no exaggeration to suggest that Tuxedo is O’Connor’s “signature” pattern. However, it is strange that the pattern is so rarely encountered. The writer has never seen an example of it — not even a photograph! Although one might suppose that the Parisian pattern would be the company’s “signature” pattern, O’Connor had assigned its patent to Dorflinger in 1886, and it would, therefore, not be appropriate for him to cut the pattern when he founded his own company. He probably cut it only upon request, to “help out” his former employer. Even though O’Connor neither advertised nor cut the Parisian pattern on a regular basis, it is shown here to complete John S. O’Connor’s set of patented patterns. As can be seen, Parisian (patent no. 16,767) is a clearly defined, elegant design that avoids the over-elaboration exhibited by many patterns of the period. It is not surprising that it was one of C. Dorflinger & Sons most popular patterns during the late 1880s and 1890s. Moderately expensive, a bowl like this one would have retailed for about $21 in the mid-1890s. Berry bowl cut in the Parisian pattern by C. Dorflinger & Sons, c1895. D = 9″ (22.9 cm), H = 4″ (10.2 cm). This bowl was offered for sale on eBay in 2003, but it failed to sell. The bidding ended at $212.50, an amount that was below the seller’s reserve (Image: Internet). The writer takes issue with Revi’s conclusions concerning the “Princess” pattern, in addition to the pattern’s name which is discussed at the end of this section. The pattern definitely does not, in the words of Revi, “[resemble] O’Connor’s Parisian pattern in many respects” (Revi 1965, p. 322), because, as can be seen in the patent’s drawing, the pattern is not based on the hobstar, as is the Parisian pattern, but on rows of large diamonds, subdivided. Moreover, these diamonds have straight sides. Therefore, the pattern also definitely does not “[employ] a great many curved miter cuts in the over-all design.” (p. 322) The curvature of the miters in the patent’s drawing is an illusion, because the illustration is a perspective drawing of the pattern. The miters are straight, not curved; the pattern is linear. This linearity can also be demonstrated by considering James J. O’Connor’s Colonial pattern of 1893 (patent no. 22,581), whose patent drawing is reproduced above, on the right. The “Princess” pattern is almost embarrassingly similar to Colonial. (But at least this copying is kept within the family!) 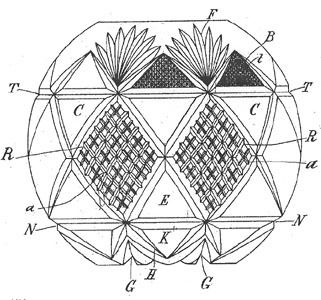 Comparing the two patents, one sees that the “Princess” pattern simply drops the two horizontal miters of the Colonial pattern and subdivides the large diamonds in one row with short vertical miter cuts, resulting in “split squares.” It is “telling” that Revi fails to recognize that it is the Colonial pattern that is cut on the shallow dish he illustrates (p. 279, upper right). There is a third candidate, however, and it could actually be the pattern’s true name. By the late 1890s O’Connor had begun an association with the New York City wholesaler Higgins & Seiter, judging from patterns advertised in the latter’s catalogs. Unfortunately, only catalogs for 1899 (no. 10) and 1900 (no. 11) are currently available. By the time of these catalogs, Higgins & Seiter was advertising a few of O’Connor patterns using O’Connor’s original names, a departure from H. & S.’s usual practice of assigning its own pattern-names to the cut glass it sold. Could the company have always used O’Connor’s names? This is supported by the fact that at least three O’Connor patterns retain the names O’Connor original gave them: Walter Scott, Caprice, and Napoleon (if Revi’s identification of the latter pattern, on p. 320, is correct). The only obvious exception to this “rule”, in regard to O’Connor’s products, is Arthur’s “Princess” pattern which H. & S. advertised as the H. & S. pattern (but sometimes with no name at all). It is possible that H. & S. requested that O’Connor, father or son, design a pattern for its own, exclusive use, and that the O’Connors obliged with patent no. 24,060 which they did not name, leaving this up to H. & S.. It is likely that the wholesaler wanted a “popular priced” pattern. “Princess”, now called H. & S., fills the bill. 1. Revi illustrates two patterns which he names “Star and Big Four” and “Big Four”. But “Big Four” is described in the 21 Aug 1895 issue of The Jeweler’s Circular as the name given to “six round handled nappies in four different cuttings”. (The cuttings are not named.) Thus, the name “Big Four” concerns objects and is not a pattern-name. O’Connor, experienced in marketing, always used patterns names that consisted of only one or two words — patterns that were easily remembered. Barbe and Reed (2003, p. 191) believe that the “Double Star and Hatch” pattern is the same as H. & S.’s Comet pattern and, although the latter shows single columns of beading while the illustration in Revi’s book has double columns, this writer agrees. He goes further, however, and suggests that Revi’s table lamp illustrates a pattern that O’Connor also called Comet. 3. Revi gives the pattern name “Star” to two entirely different patterns cut on two well-known objects — the O’Connor red cut-to-clear punch bowl and a decanter in the form of a bowling pin. The pattern on the decanter is unknown, but that on the punch bowl is clearly seen as Chrysanthemum in the H. & S. catalogs. Because of our previous discussion, the writer believes that this is also the name O’Connor gave to the pattern on his punch bowl. 20 Mar 1895, p. 30: Unnamed patterns by O’Connor, offered by Geo. Borgfeldt & Co., NY, NY. One, on a bowl and on a loving cup, is the Crescent pattern. Two other patterns are shown but thus far are unidentifiable. 19 May 1897, p. 32: Crescent, illustrated on two decanters: handled and not handled. 26 May 1897, p. 18: Caprice, illustrated on a bowl, shape no. 120. 11 Aug 1897, p. [? ]: “Vesica” illustrated on a bowl. This preliminary review of the cut-glass patterns produced by John S. O’Connor’s cutting shops in Hawley and Goshen has unearthed 21 named patterns, but illustrations for only a few of them are available. 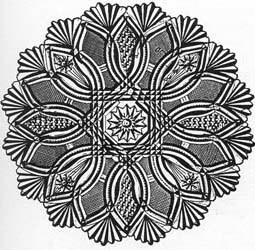 In addition at least four illustrated patterns have been published in the past, but without identification.